Our garages play a very important role in our everyday living. Of course, they protect our vehicles from the elements. But more often than not, they also become dumping grounds for tools, cleaning products and seasonal gear. These tips can help you make the most out of this often overcrowded and underused space. 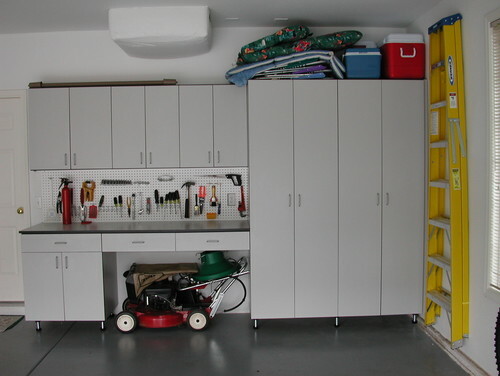 Built-ins, pegboards, slat walls and other smart storage solutions can help you eliminate clutter and keep your garage tidy. 1. Shoe storage. The garage door is the main entrance in many homes. If shoes aren't allowed in your house, this is a great way to stop the pileup of shoes outside your main door. 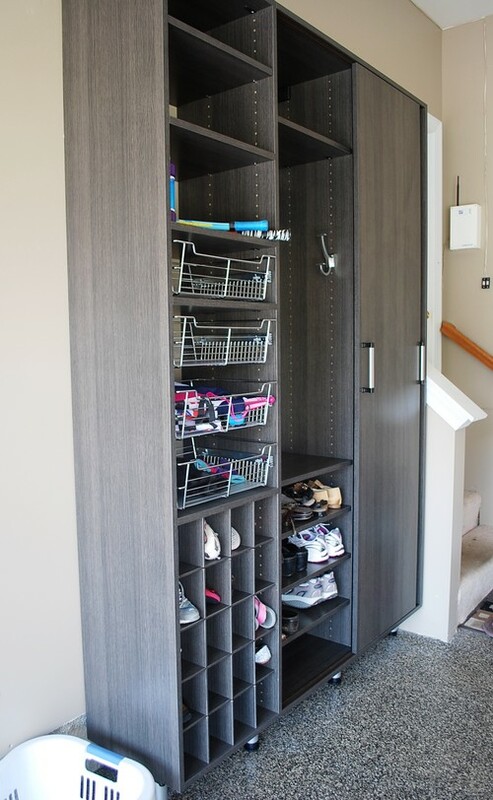 A shoe organizer — whether built in or store bought — can instantly clear the floor. 2. A multipurpose bench. 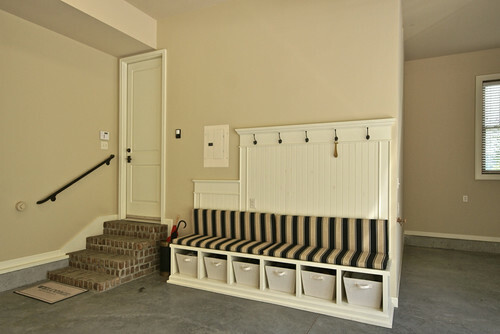 An extra-long bench next to a garage door keeps outdoor gear tidy. Hooks, cubbies and a cozy seat make it easy for kids to remember to take off their coats, caps and gloves before coming inside the house. 3. A loft. High ceilings can make up for limited floor space in smaller garages. Consider a loft for storage, as in this garage. This loft almost acts like an attic, with a low-clearance ceiling height and retractable ladder. The railing ventilates the space and cut down on building costs. 4. Overhead storage. 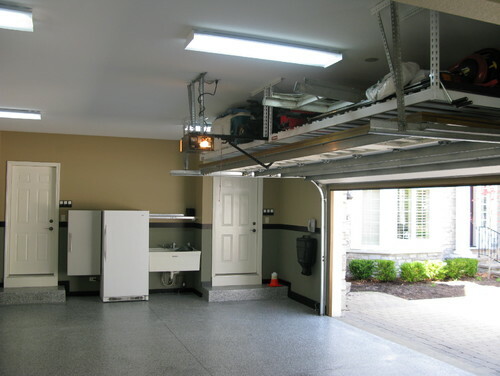 If you're not ready to invest the time and money it takes to build a loft in your garage, overhead storage units are a great compromise. Suspended shelving just above the garage doors provides out-of-the-way storage space without the messy remodel. Use these shelves to store items you rarely need to access — like holiday decorations. 5. A slat wall. Retail stores often use these walls to keep things off the floor but within reach. Different hooks and shelves fit into the horizontal slats, making for a customized storage center with minimal effort. The right hook can hold anything from skis to toys to lawn chairs. 6. Commercial cabinetry. You don't need to build in storage to stay organized. Cabinets, drawers and shelves from your local organization or home goods store can help you clear clutter without the extra cost. Look for storage that stands on legs to avoid potential water issues. 7. Pegboards. There's a reason the pegboard hasn't gone out of style — it's simple, affordable and incredibly effective. With the right pegs to fit into the holes, a pegboard can hold just about any tool or material for your garage workspace. 8. Built-in cabinetry. Built-in cabinetry is a budget buster, but it's worth it if you have the funds. 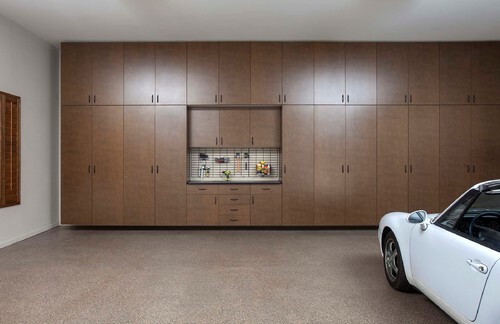 The wall-to-wall and floor-to-ceiling cabinetry in this garage make it easy to keep everything tidy. It's the most expensive but most beautiful way to keep a garage organized.